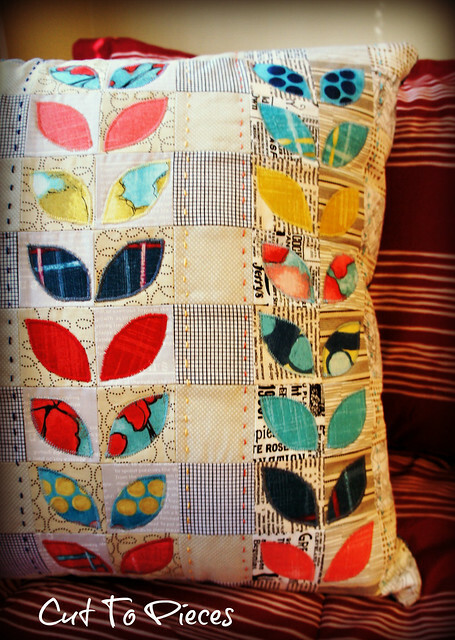 I showed you the pillow top in the making the other day, but I’m pleased to say that today I finished the whole pillow. I went in my sewing room today intending to work on my Mario Blocks…I’m a little behind. (whoops!) But instead this pillow was calling at me to be finished. So I buckled down and got this project off of my to do list. I once again grabbed some fabric from my stash to complete the project. The lining is a large print from Basic Grey that has been sitting there mocking me from the top shelf. I finally decided to give it a home inside this pillow. I think the backing was a Joann’s find and I used an invisible zipper that I didn’t bother to make invisible. 😉 You can see the green lining fabric also at the end of the zipper. This pillow has a happy home in my other guest room. I wanted a spot of handmade goodness on top of that store bought generic comforter. If you recall, the fabrics showcased are from Laura Gunn’s latest line, Cosmos. 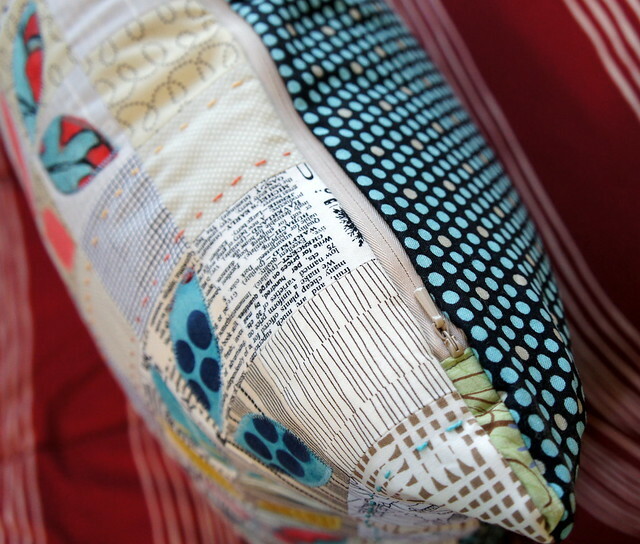 And my pillow design was completely inspired Jolene’s pillow and Brioni’s pillow. 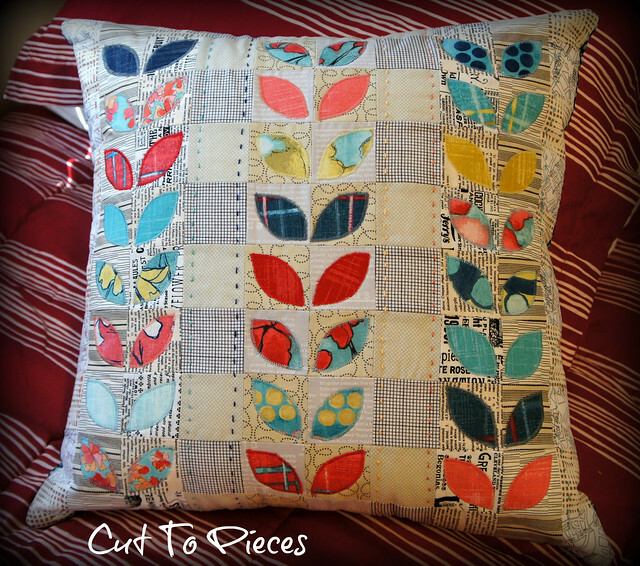 That pillow design is so awesome as are your fabric! I think I need one for ME. You have such a way of combining fabrics and little touches I love it! 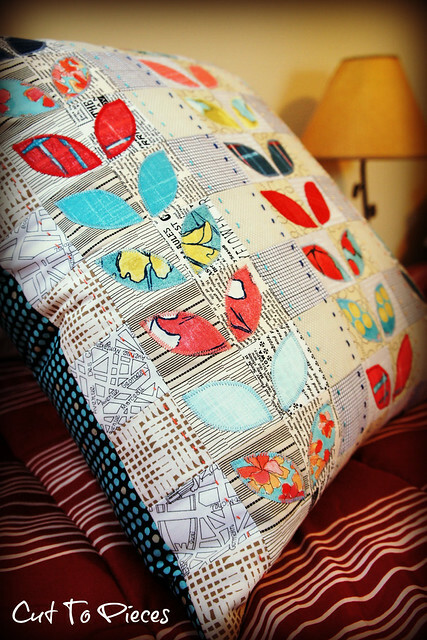 Your new pillow will most certainly spice up your guest room! It's so pretty. It is so pretty! I really like this. Very cute I love it I have had a busy summer and am just now getting to sewing again. I love to sew and need to reevaluate all I do in the summer seems like sewing is left behind. Thanks for sharing you always have such cute things. It's simply lovely!! The mix of bright fabrics is really fun and I like the way you did the running stitch along the the sash part. Genius! I love your choice of fabric – the leaves look great against the background prints. I really adore this pillow! Cosmos looks like a great new line, and you really found a fun way to use up your samples!